Her phenomenally successful career lifted off quickly in the ‘50s for teen-age Debbie Reynolds and she soon was a major star and still remains so. Singin’ in the Rain was a huge hit, followed by decades of charming roles including Tammy and the Bachelor and The Unsinkable Molly Brown, just a few of her more than fifty films. Many of those vehicles featured memorable costumes for characters ranging from flapper to sweet country girl and chic sophisticate. 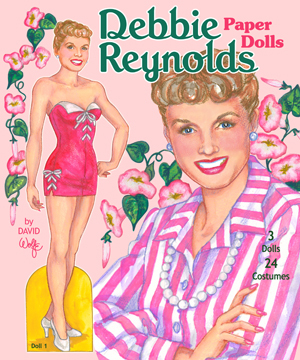 Debbie Reynolds looked adorable in all of them and this new paper doll book by David Wolfe features the fashionable facet of a famous star’s meteoric career. Three Debbie dolls capture the star’s appeal and eight pages of costumes will stir recollections of her many, many memorable movie roles including Singin’ in the Rain, Tammy and the Bachelor, The Unsinkable Molly Brown, Bundle of Joy, Susan Slept Here, The Singing Nun, The Tender Trap, It Started with a Kiss, I Love Melvin, What's the Matter with Helen? and Goodbye Charlie.